Thousands of passengers flying in the US and Europe are at risk of having their flight disrupted due to an airport strike on both continents. At several major US airports, service workers (security officers, baggage handlers, janitorial staff, etc.) planned to walk off the job in a demand for better wages and union rights, according to reports by The Washington Post. Likewise, air traffic controllers in France have gone on strike for the second time this month, which according to The Telegraph has seen flight disruptions ripple across the whole of the EU. 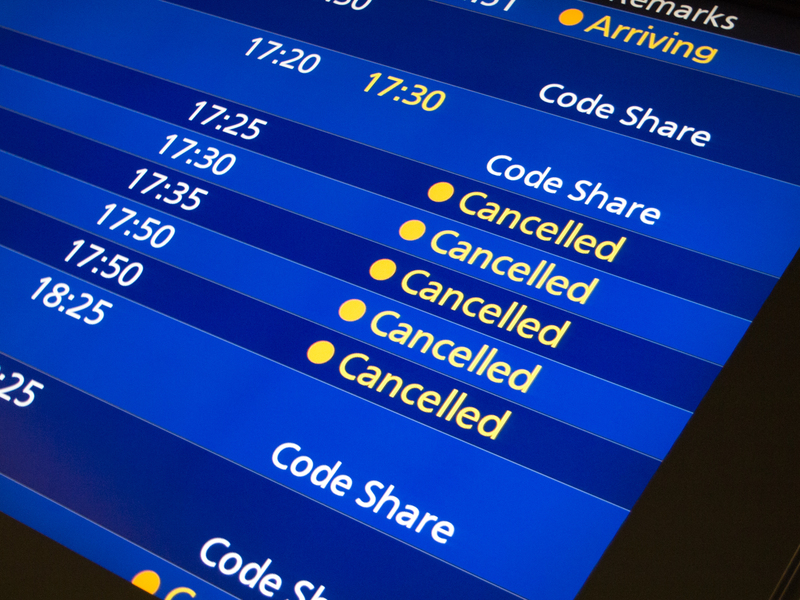 So what should you do if your flight is at risk of being cancelled or delayed due to airport strikes? The best thing you can do if your airport has a strike looming is to check your airline’s website right away. They will usually have important information posted on their homepage outlining which flight/airports are affected and offer advice on what passengers should do. On top of that, some airlines have recently started to offer full refunds or free re-bookings in advance of planned strikes, so it pays to go ahead and call your airline’s customer service to see what your options are before you even head out the door. If you’re really desperate – or just can’t seem to get any sort of empathy from the airline customer service reps on the phone or at the airport – you can always air your grievances on social media. Most of the time public complaints on social platforms are escalated to help the company save face, so feel free to Tweet, post and troll away if necessary! Airport strikes initiated by airport employees or air traffic controllers are considered “extraordinary circumstances,” which means that in those circumstances, the airlines are not legally liable to pay you monetary compensation for your cancelled or delayed flight. If the strike is initiated by airline employees, your flight is still eligible for compensation. With that said, the right to financial compensation must be claimed within three years of the disrupted flight. Remember, the reason for the delay in flight operations must be caused by the airline and the right to financial compensation must be claimed within three years of the delayed date of the flight. In the US – unless you have elite status with your airline – you’re more or less out of luck, as the airlines have no obligation to compensate you in any way. In most circumstances, the only thing your airline is likely to offer you is a refund or rebooking on one of the next flights out. If you happen to be one of the unlucky out-of-towners on your flight, good luck trying to get the airline to pay for your hotel or extra expenses while you wait it out! However, if you’re stranded in the EU overnight due to a strike, your airline will have to provide you with hotel accommodation plus transport, food, refreshments and access to two calls or messages (phone, email, etc.). For more info about your rights during a strike in Europe, check out our full breakdown here. Finally, it can pay to check out the contract of carriage with your particular airline to see what – if anything – you might be entitled to under your carrier’s own terms and conditions. Pro Tip: Google the phrase “contract of carriage” along with the name of your airline to track down this info super fast! It can be very frustrating for travelers to learn that they are not covered under either US or EU passenger rights laws for flights disruptions due to certain strikes, but all hope is not lost, my friends! You have a few options at your disposal if your flight delay is not covered by passenger rights laws, and one of them is checking to see if your travel insurance covers airline/airport strikes. If you are like me and are not the type to buy traditional travel insurance, you may be covered still and not even know it! Most travel credit cards these days offer travel insurance as a complimentary perk for cardholders, so make sure to always book your flights with these cards and call their customer support teams ASAP to see if they might be able to rebook or reimburse you for flight disruptions due to strikes. Not to sugar coat it or anything, but in the rare event of an airport strike, check your flight’s eligibility because strikes initiated by airline employees means your flight could qualify you for compensation. Or, you can always splurge and pay for a brand new ticket out of pocket, but that’s not always an option for the average traveler, since it’s a really expensive alternative. My best advice for you is to check your claim eligibilty, and certainly, keep all of the receipts for the expenses you incurred during your strike delay or cancellation, and then send everything to your airline’s customer service via email when you finally make it home. Most of the time gate agents and airline representatives at the airport don’t have much authority to do anything more than rebook you on the next available flight. However, online customer support may out of the kindness of their hearts repay you for some of your extra expenses or even offer you free miles as a sign of good faith. When in doubt, AirHelp’s friendly customer support team is always here for you, so feel free to reach out with any and all questions about your passenger rights!